KTM’s final member of the 390 series, the 390 Adventure has finally been spotted testing on Indian roads. 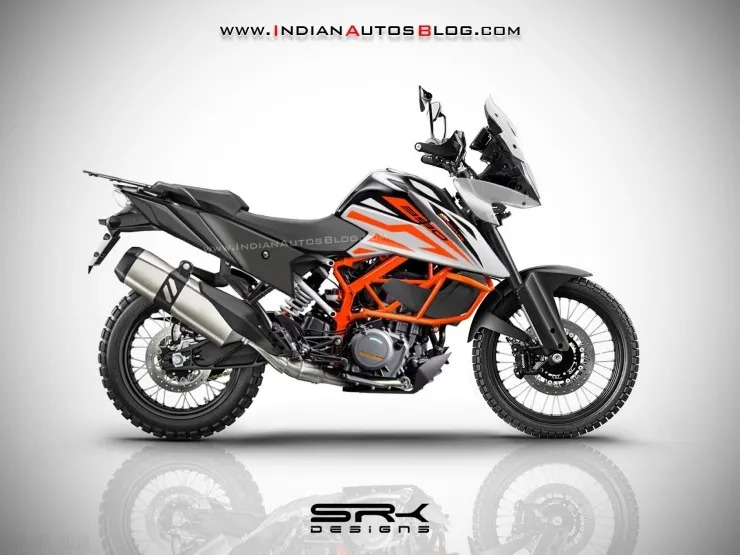 The test mule of the upcoming 390 Adventure from KTM which is now expected to arrive in 2019 was spied in near-production guise, which suggests that KTM is in the final stages of testing the new bike. 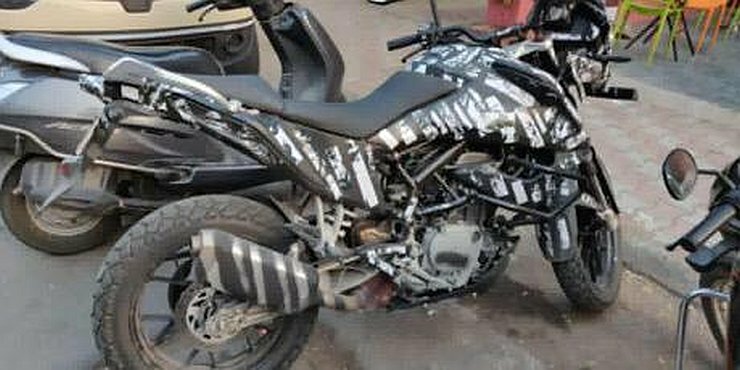 The test mule of the KTM 390 Adventure spotted in India was seen riding on alloy wheels and dual-purpose tyres. Earlier test bikes spotted in Europe have been spied with spoked wheels. This has lead to speculation that there could be multiple version of the 390 Adventure when it arrives in 2019. 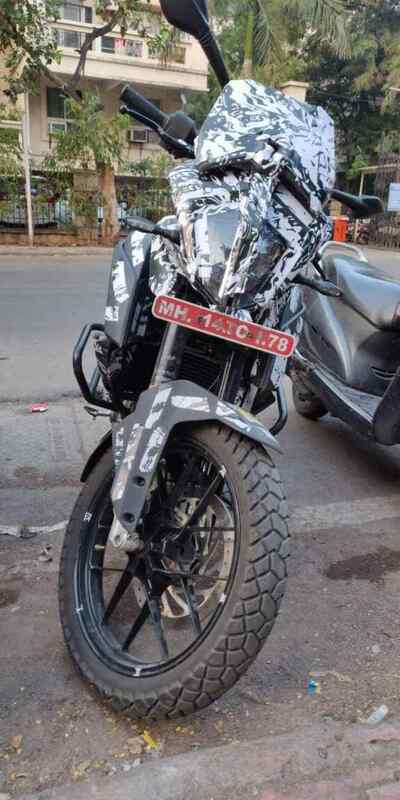 Moving to the KTM 390 Adventure spied on Indian roads, the test mule remains highly camouflaged to keep details away from the eyes of roving shutterbugs. 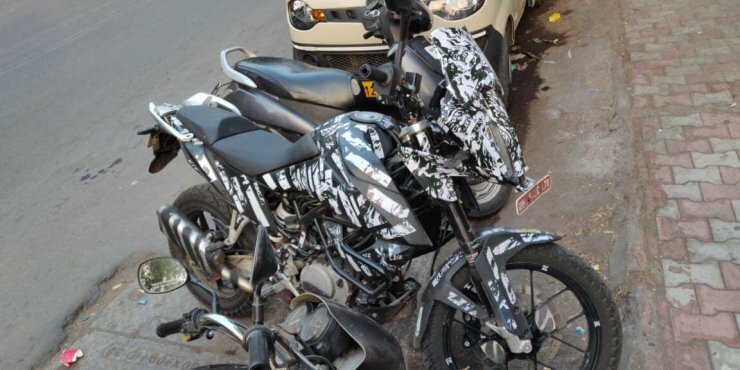 However, the major details of the bike can be seen hidden underneath the camo treatment. Up front, the bike features long travel suspension. The front forks look to be adjustable as well, a fact confirmed by the presence of the red adjustment knob that sit atop the forks. The bike also features an offset spindle, which reduces trail allowing the bike to run on a bigger front wheel without compromising the stability of the bike. The bike appears to be running a 19-inch wheel up front and 17-inch unit at the rear. Under the heavy camouflaged body sits the 373.2 engine found on the KTM 390 Duke & RC 390 along with the Bajaj Dominar 400. However, the test mule sports a rather chunky looking exhaust setup, which suggests that the new bike will be compliant with new BS-VI rules when it arrives next year. The rear end features a monoshock suspension setup along with a swingarm which could be longer on the production bike compared to its other siblings in the 390 range. Braking duties on the bike are handled by disc brakes on both wheels which are augmented by dual-channel ABS. Coming to the design of the bike, the test mule retains what appears to be the 390 Duke’s split headlight setup, where the centre section also acts as a heat sink. The headlight is part of a failed setup up front which looks quite similar to the found on the 790 Adventure. The switchgear, mirrors and indicators on the test mule seem to have borrowed straight off the 390 Duke. The handlebars though are taller and wider as well. Also seen is the TFT screen form the 390 Duke. The heavily camouflaged motorcycle features a similar size tank to the 390 Duke, though it could be slightly larger than it currently appears in the production bike. The test mule also sports a metal crash guard on the side to provide extra protection to the rider when on the move. The test mule features a split seat and the bike also gets a short tail section with a rather small taillight. There are large grab handles present and the bike could be offered with luggage carriers when it arrives next year. Prices for the all-new KTM 390 Adventure are expected to start at around Rs 3 lakh ex-showroom. The new bike which will be produced at Bajaj’s Chakan facility will compete with the of the BMW 310 GS when it arrives next year.